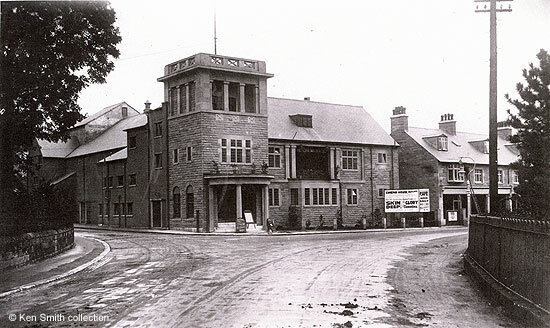 The large stone built former cinema complex on the corner of Steep Turnpike and Causeway Lane had only just been built when this photograph was taken. The row of shops next door to the cinema were still being fitted out. There's an estate agent's board next to the pavement and a man is at the top of a ladder doing something to the front of the shops building. The cinema was built by the contractors Messrs John William Wildgoose, Ltd. of Matlock and the architects were the Derby firm of Naylor and Sale. It cost close on £20,000 to build and was luxuriously furnished. The Cinema House, where George Woodman was manager in 1925, was opened on 18 December 1922. Cinema going had become increasingly popular and Matlock Cinema House was Matlock's second cinema - the Picture Palace on Dale Road had opened about 1916. Disaster struck in the early hours of 31st May 1931 when fire destroyed the interior and the roof was ruined, allegedly through someone throwing down a cigarette on the balcony during the previous evening's performance. The manager, Harry Hodgkinson, had locked up at 11.30 p.m. on the Saturday evening and a policeman had passed the building around 2a.m. on Sunday morning; neither noticed anything was wrong. The fire was discovered quite by chance at 3 a.m. by Jack Robinson, an employee, who had returned to the cinema for a pair of shoes that he had accidentally left behind and which he needed for a motor cycle trip to London. He called Matlock Fire Brigade. The members of the Fire Brigade who attended the fire later received a gift of a guinea from the directors of Matlock Cinemas, Ltd., "for such efficient service". The cinema was used for a variety of functions, including Ernest Bailey School's Speech Days. In 1933, after a three year gap because of the economic situation, this event returned to the Cinema House. Matlock and District Amateur Operatic Society productions also took place here, though not in the year after the fire. It wasn't until around the New Year of 1955 that Northern Cinemas, by then the cinema's owners, decided to change the name to The Ritz Cinema. The Council were in uproar about the new name. Anything would apparently have been acceptable but definitely NOT The Ritz! Whilst Northern Cinemas couldn't have been overduly bothered by the association, what upset the Council was that the same name had been used by "a fried fish shop" which had been somewhere adjacent to the cinema and which the Council had closed down not long before! The films advertised on the bill boards have helped to date the picture. Although it is difficult to read all the words, the double bill included two films that were came out in 1922. "Skin Deep" was a film directed by Lambert Hillyer that starred, amongst others, Milton Sills and Florence Vidor. The second film was "The Glory of Clementina" which starred Pauline Frederick. The same bill board announces that the Café was open daily during the week from 10 a.m. until 10 p.m. and on Sundays between 3 and 7 p.m. In the collection of, provided by and © Ken Smith. "Derby Daily Telegraph", 19 December 1922. An application for a cinema license had been made in early December by Mr. F. C. Lymn, but as the seating was not fixed at the time, the justices adjourned the application pending the completion of the building.